While out in the garden the children asked for the parachute. The parachute was promptly brought out and the children had great fun hiding under it. Charlie and Jacob used cones to hold the parachute up, while Roisin and Caoimhe were running through it. Great fun was also had playing peek-a-boo under the parachute. Charlie’s Mum thought using the cones to hold up the parachute was a great idea and Sam’s Mum loved to see the children playing peek-a-boo. This week some of the children in the Discovery Room wen ton an outing in the local estate. They got appropriately dressed wearing hi-vis jackets and wet gear. Before setting off the children were briefed on the safety of the outing. Some children brought plastic bags with them to collect anything of interest to them on the outing. Whilst out on the walk the children learned how to cross the road safely- looking and listening and the importance of meeting points. While on the walk Eilish ran to the top of a grassy hill to hear her voice echo. 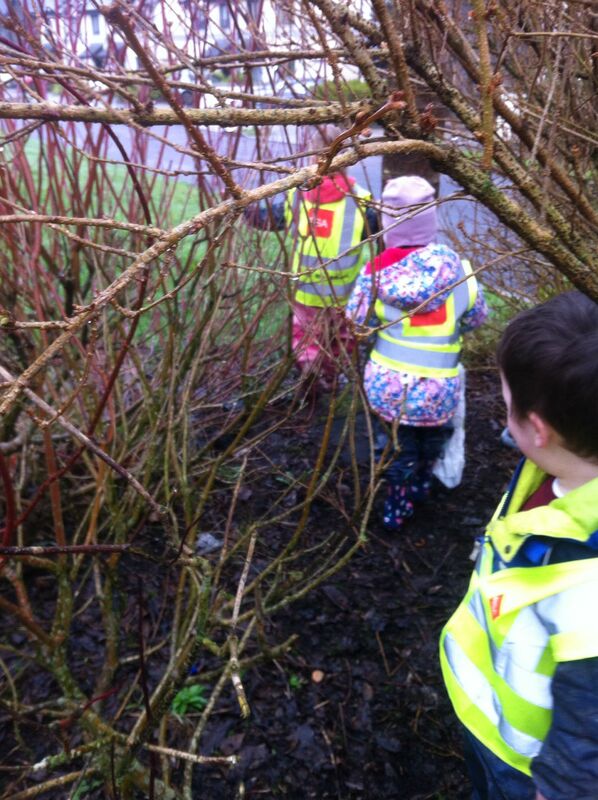 Lee enjoyed picking up sticks for the bug hotel. Peter showed us where his house was and we met Rose’s Mum at home. She said it was nice for everyone to see her house on the walk. Tomas’s Mum said he likes to hold hands when out and about. It was a very wet week so our outside area was full of puddles and mud. The children loved playing in the puddles and they also spent a lot of time jumping in the mud too. Rudy loved splashing in the puddles. If the wet weather continues we will try to make bubbles in the puddles and play with them. Some parents were delighted to see the children playing in the puddles especially as they were really enjoying themselves.